Pruning trees is more than trimming overgrown plants. It is (or should be) an imitation of nature’s own practice of removing weak branches, thinning out limbs, which get in each others way, and removing overlong shoots. All this strengthens the tree and increases the production of foliage, flowers and fruit. All pruning equipment should be kept sharp, and should be suited to the job in hand. Too large or too small tools result in ragged cuts, which may damage the tree. There are three main types of pruning saw the hacksaw type which has interchangeable blades, the double-sided saw, and a single-sided hooked saw used for rough work. A pruning knife is handy for trimming. Heavy gloves are useful. There are also many power operated tools available which can reduce the amount of heavy work required. Start pruning when the tree is still young. Keep in mind the character of the fully-grown tree when shaping a young tree. Cut regularly, rather than heavily whenever you think of it. Too-heavy pruning can result in an unattrac­tive mop-head appearance caused by the rash of new growth. Most pruning is done in autumn or winter. Newly transplanted trees should be pruned whatever the season, because their root system is greatly reduced by the move. Cut as close to the base of the piece you are cutting as possible. 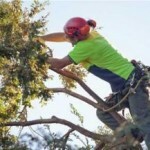 To avoid tearing off part of the trunk when a branch fails away, make the first cut under the branch to about half-way through then cut from the top. Large branches should be cut into pieces and lowered by rope down the tree. The failing branches are not only a danger to people underneath, they can damage the tree as they fall. Trees such as the conifers produce enough sap to protect the cut surface. Other trees should have a dressing of tree paint applied to the cut edge. For safety, do as much pruning as you can from the ground. If working from a ladder, ensure it is standing on solid ground. Do not try to reach too far out from the ladder. It is safer to climb down and move the ladder, pruning only the area within reach each time.